The Atlantic City Boardwalk Bullies of the East Coast Hockey League re-signed goaltender Scott Stirling, it was announced today by Bullies Head Coach and Director of Hockey Operations Mike Haviland. Terms of the deal were not disclosed. Last season, the 25-year old from Hull, Mass., set a franchise record for most wins in a season with 24. He appeared in 42 games and posted a 24-12-3 record with a 2.74 goals against average and a .918 save percentage. Stirling also played five games for the Peoria Rivermen registering a 2.00 goals against average, a .923 save percentage, and a 4-1-0 record. The Atlantic City Boardwalk Bullies of the East Coast Hockey League announced its 2002-03 regular season schedule today. Matchups include five home and five road games against intrastate rival Trenton Titans, and first-time visits from the Pee Dee Pride and the newly relocated team in Lexington, Ky.
With the end of summer comes the beginning of the Flyers Rookie Camp at the Skate Zone in Voorhees. They were in need of a goalie for their scrimmage, so they asked Eastern High School and Bantam AA goalie Bryan "Teebs" Williams to participate. Only two current Flyers were on the ice, Marty Murray (on the ice the entire time) and Eric Desjardins (appearing at the end), joined by ex-Flyer Peter White. One of the players from the Phantoms was Joe Depenta, who stayed around and stood in front of Williams for some nice photos by Pedro Cancel. 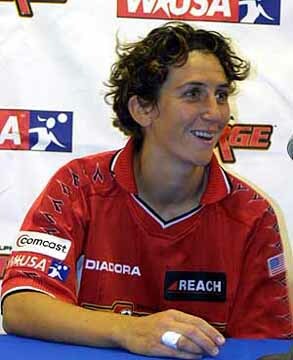 One day after being named the WUSA Offensive Player of the Year, Philadelphia Charge forward Marinette Pichon was honored as the league's 2002 Most Valuable Player on Thursday. 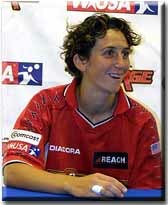 Pichon, who is currently in France with her national team, became the second consecutive WUSA player to capture both awards. New York's Tiffeny Milbrett also accomplished the feat in the inaugural campaign. Philadelphia Charge forward Marinette Pichon and defenders Erica Iverson and Jen Tietjen were named to the All-WUSA First Team on Wednesday. In addition, midfielder Zhao Lihong and defender Jenny Benson were named to the All-WUSA Second Team. Philadelphia's five total players on both teams were tied for best with Carolina, which had four on the First Team and one on the Second Team. Pichon was also named the league's Offensive Player of the Year Wednesday after leading the Charge with 14 goals and 29 points in just her first year in the league. The Frenchwoman, who also had an assist this season, set Charge single-season records in goals and points and became the franchise's all-time leading scorer. 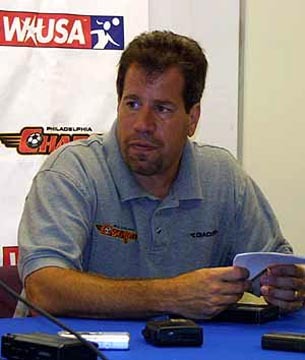 The Women's United Soccer Association named Philadelphia Charge head coach Mark Krikorian Coach of the Year Tuesday. 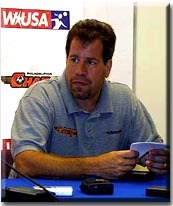 Krikorian finished ahead of both Carolina's Marcia McDermott and Washington's Jim Gabarra in the poll, which was voted on by WUSA coaches, general managers, players, and select media representatives. X Games VIII drew to a close today and is boasting the best X Games in its eight-year history. The event experienced many firsts this year, as well as welcoming the X Games' two millionth fan, showcasing unprecedented athletic tricks, introducing women's exhibitions and seeing a spectator fan base that beat last year's averages. Rodil de Araujo Jr. came to Philadelphia to do his best work and the 23-year-old Brazilian left the "City of Brotherly Love" with a handful of gold to show for his efforts. Araujo Jr.'s finishing move came in during his final run on Monday in the Skateboard Park competition. It was a run that included a Switch Frontside Boardslide, a Frontside Flip-to-Fakie and a Switch Frontside Tailslide-to-Fakie that helped seal the deal with a score of 93.00. The finale finished off a remarkable 10-day run for de Araujo Jr., who also brought home gold in both the Skateboard Street and Skateboard Best Trick. After having to settle for second place in the Aggressive In-Line Vert finals in each of the previous two X Games, Takeshi Yasutoko earned his first-ever gold medal with a pair of sparkling runs during Monday's Vert final. Yasutoko continued his high-flying style by soaring 14-plus feet in the air throughout the competition, landing Flat Spins, Backside Disaster Rails and many others on his way to a high score of 97.00. His brother, Eito, was a close second with a score of 93.75 - it was his fourth medal at the X Games (two gold, silver, bronze). Marc Englehart, of nearby Lansdale, Pa. Won his first-ever X Games medal with a score of 89.75 for a bronze. Mike "The Godfather" Metzger started a new era in Freestyle Moto X, while Carey Hart finished what he started a year earlier during the Big Air competition to end X Games VIII in Philadelphia on Monday evening in front of a jam-packed crowd at the First Union Center. Metzger landed a Backflip off the ramp, called The Godfather, in each of his three attempts, including a No-Handed Lander to end the event and seal the gold medal with a score of 95.00. Metzger was crowned best overall X Games athlete, winning a Fender guitar, following gold-medal performances in Freestyle, Big Air and a silver in Sunday's Step Up competition.